Aerial acrobat well-versed in dogfighting tactics. Powerglide is one of the relatively few Transformers I owned when growing up. His size and price at the time made it an easy gift for family and relatives to pick up for bunches of kids, which more than likely lead to his popularity. There have been very few toy iterations of Powerglide over the years � the mini-vehicle from G1, followed by a much more steroid infused Ultra-class redesign in the Universe line (with two repaints), a small but realistic A-10 Warthog from Dark of the Moon, and now the new Combiner Wars version. Powerglide also moonlighted as a ground vehicle during Animated, but alas, there was no toy made of that version. My purchase was fueled solely by nostalgia for a smaller, more G1 accurate Powerglide � I have a soft spot for the little guy. 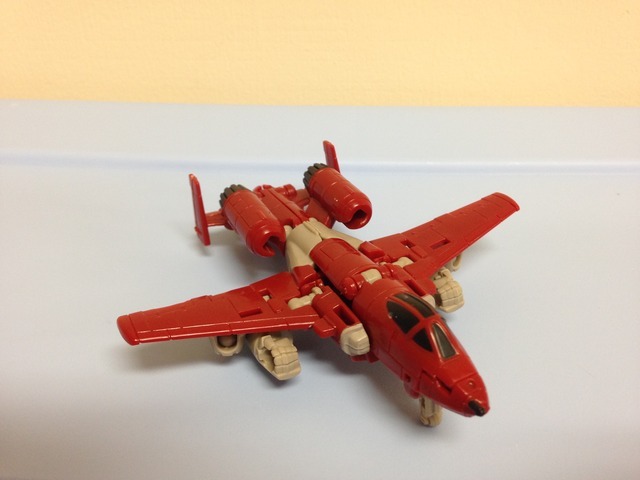 Powerglide�s alternate mode is a red and grey A-10 Warthog. The design is well done and fairly accurate for such a small toy. Red is the primary color throughout, with bits of grey here and there. There�s a tiny bit of black on the cockpit windows, the front machine gun, and on the ends of the thrusters. The Warthog mode is quite stable when it�s all tabbed properly together, and it sits nicely on a pair of molded (non-spinning) rear wheels and front landing gear. Everything sits well enough that the plane is balanced and doesn�t tip to the wings. If I was forced to point out something that may out of place, I would pick the hands/arms underneath the wings � but that�s really nitpicking since the original did the same thing. For the small size class, it would be difficult to mask by design. Otherwise, the A-10 Warthog mode is spot on, a lot of fun, and faithful to the original. In my opinion, Hasbro knocked it out of the park with this one. The Legends class is quickly becoming my favorite size class, even eclipsing Deluxes. Hasbro/Takara have really done a fantastic job over the last few years by designing good Transformers in an affordable and shelf-space efficient size. Powerglide is a beautiful update of the G1 minibot. The colors (red & grey) are faithful to the original while also adding a large Autobot symbol on the chest in lieu of a rub sign. It looks great, and the blend of colors is great. Powerglide's design features a significant amount of articulation and balance. Ball joints in the shoulders, hips, and knees give a great range of motion, while the bending elbows also have good range, and the neck swivels. Powerglide stands well and has good weight distribution; large, stable feet are a big help. The whole robot mode tabs together tightly as well. Aesthetically and functionally, Powerglide checks all the right boxes. Between the two main modes, Powerglide looks good and is great fun. A can't miss figure, in my opinion. I should also mention that Powerglide has a third mode - a gun/weapon that can be paired with either an appropriate Deluxe or Voyager (as pictured on the back of his card) or with Combiner Wars Superion. I personally haven't put Powerglide into his 'gun' mode - I don't really have a need for it. To me, it's rather silly and looks like the back of a jet with a handle. If anything, the extra mode doesn't detract from Powerglide in any shape or form. Hasbro/Takara didn't make any design concessions on the figure to fit it in. I'll just pretend it doesn't exist. Transformation Design: 7. Well designed and fun. A small package with an enjoyable transformation. Durability: 8. It�s possible that some tabs will stress over time, but overall this is a solid toy. Fun: 9. There aren�t any gimmicks to be had, but Powerglide doesn�t need any. Both modes are good, and the weapon mode is another bonus for use with Combiner Wars Superion. Aesthetics: 8. He�s small and looks good in both modes. How can you go wrong? Articulation: 9. Very limber for such a small �bot. The number of ball joints is a huge help, and nothing is hindered. Value/Price: 9. With prices on the rise, this is becoming my favorite size class. $10 USD is a little steep, but considering that all Transformers have increased in price, this one is super fun at the lower end of cost. Overall: 9. 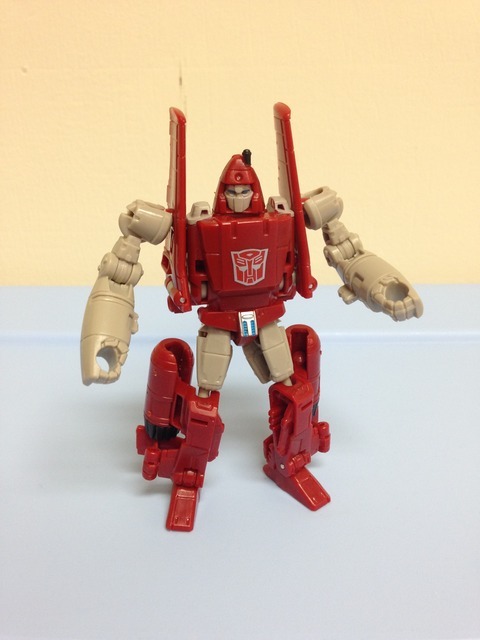 He�s not perfect, but Powerglide is inexpensive and really fun. There�s a lot of joy to be had for such a nice little Transformer. I don�t want to over-praise this one, but there aren't any negatives I can think of that would dissuade you from purchasing him.